Would you get on a plane that didn't have a human pilot in the cockpit? Half of air travelers surveyed in 2017 said they would not, even if the ticket was cheaper. Modern pilots do such a good job that almost any air accident is big news, such as the Southwest engine disintegration on April 17. But stories of pilot drunkenness, rants, fights and distraction, however rare, are reminders that pilots are only human. Not every plane can be flown by a disaster-averting pilot, like Southwest Capt. Tammie Jo Shults or Capt. Chesley "Sully" Sullenberger. But software could change that, equipping every plane with an extremely experienced guidance system that is always learning more. In fact, on many flights, autopilot systems already control the plane for basically all of the flight. And software handles the most harrowing landings – when there is no visibility and the pilot can't see anything to even know where he or she is. But human pilots are still on hand as backups. A new generation of software pilots, developed for self-flying vehicles, or drones, will soon have logged more flying hours than all humans have – ever. By combining their enormous amounts of flight data and experience, drone-control software applications are poised to quickly become the world's most experienced pilots. Drones come in many forms, from tiny quad-rotor copter toys to missile-firing winged planes, or even 7-ton aircraft that can stay aloft for 34 hours at a stretch. When drones were first introduced, they were flown remotely by human operators. However, this merely substitutes a pilot on the ground for one aloft. And it requires significant communications bandwidth between the drone and control center, to carry real-time video from the drone and to transmit the operator's commands. Many newer drones no longer need pilots; some drones for hobbyists and photographers can now fly themselves along human-defined routes, leaving the human free to sightsee – or control the camera to get the best view. University researchers, businesses and military agencies are now testing larger and more capable drones that will operate autonomously. Swarms of drones can fly without needing tens or hundreds of humans to control them. And they can perform coordinated maneuvers that human controllers could never handle. Whether flying in swarms or alone, the software that controls these drones is rapidly gaining flight experience. Could humans control these 1,218 drones all together? Experience is the main qualification for pilots. Even a person who wants to fly a small plane for personal and noncommercial use needs 40 hours of flying instruction before getting a private pilot's license. Commercial airline pilots must have at least 1,000 hours before even serving as a co-pilot. On-the-ground training and in-flight experience prepare pilots for unusual and emergency scenarios, ideally to help save lives in situations like the "Miracle on the Hudson." But many pilots are less experienced than "Sully" Sullenberger, who saved his planeload of people with quick and creative thinking. With software, though, every plane can have on board a pilot with as much experience – if not more. A popular software pilot system, in use in many aircraft at once, could gain more flight time each day than a single human might accumulate in a year. As someone who studies technology policy as well as the use of artificial intelligence for drones, cars, robots and other uses, I don't lightly suggest handing over the controls for those additional tasks. But giving software pilots more control would maximize computers' advantages over humans in training, testing and reliability. Unlike people, computers will follow sets of instructions in software the same way every time. That lets developers create instructions, test reactions and refine aircraft responses. Testing could make it far less likely, for example, that a computer would mistake the planet Venus for an oncoming jet and throw the plane into a steep dive to avoid it. The most significant advantage is scale: Rather than teaching thousands of individual pilots new skills, updating thousands of aircraft would require only downloading updated software. These systems would also need to be thoroughly tested – in both real-life situations and in simulations – to handle a wide range of aviation situations and to withstand cyberattacks. But once they're working well, software pilots are not susceptible to distraction, disorientation, fatigue or other human impairments that can create problems or cause errors even in common situations. Already, aircraft regulators are concerned that human pilots are forgetting how to fly on their own and may have trouble taking over from an autopilot in an emergency. In the "Miracle on the Hudson" event, for example, a key factor in what happened was how long it took for the human pilots to figure out what had happened – that the plane had flown through a flock of birds, which had damaged both engines – and how to respond. Rather than the approximately one minute it took the humans, a computer could have assessed the situation in seconds, potentially saving enough time that the plane could have landed on a runway instead of a river. Aircraft damage can pose another particularly difficult challenge for human pilots: It can change what effects the controls have on its flight. In cases where damage renders a plane uncontrollable, the result is often tragedy. A sufficiently advanced automated system could make minute changes to the aircraft's steering and use its sensors to quickly evaluate the effects of those movements – essentially learning how to fly all over again with a damaged plane. The biggest barrier to fully automated flight is psychological, not technical. Many people may not want to trust their lives to computer systems. But they might come around when reassured that the software pilot has tens, hundreds or thousands more hours of flight experience than any human pilot. Other autonomous technologies, too, are progressing despite public concerns. Regulators and lawmakers are allowing self-driving cars on the roads in many states. But more than half of Americans don't want to ride in one, largely because they don't trust the technology. And only 17 percent of travelers around the world are willing to board a plane without a pilot. However, as more people experience self-driving cars on the road and have drones deliver them packages, it is likely that software pilots will gain in acceptance. The airline industry will certainly be pushing people to trust the new systems: Automating pilots could save tens of billions of dollars a year. And the current pilot shortage means software pilots may be the key to having any airline service to smaller destinations. 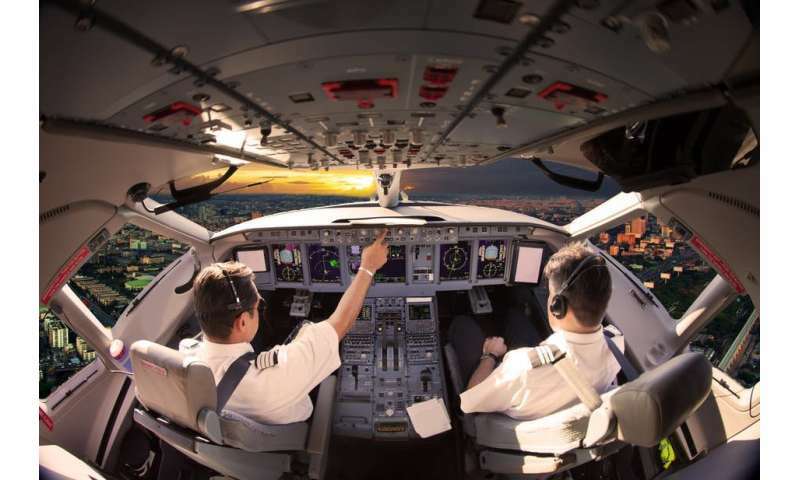 One way to help regular passengers become comfortable with software pilots – while also helping to both train and test the systems – could be to introduce them as co-pilots working alongside human pilots. Planes would be operated by software from gate to gate, with the pilots instructed to touch the controls only if the system fails. Eventually pilots could be removed from the aircraft altogether, just like they eventually were from the driverless trains that we routinely ride in airports around the world. "A popular software pilot system, in use in many aircraft at once, could gain more flight time each day than a single human might accumulate in a year." "Unlike people, computers will follow sets of instructions in software the same way every time. That lets developers create instructions, test reactions and refine aircraft responses." These quotes explain why we need people at the controls. Flight time for people creates experience, nuanced information, that is useful in unusual situations. Following instructions blindly is OK for computers, but I do not want to be a victim of a "computer glitch".